On 5 November the IHRA successfully concluded its second bi-annual Plenary meeting under the Hungarian Chairmanship. 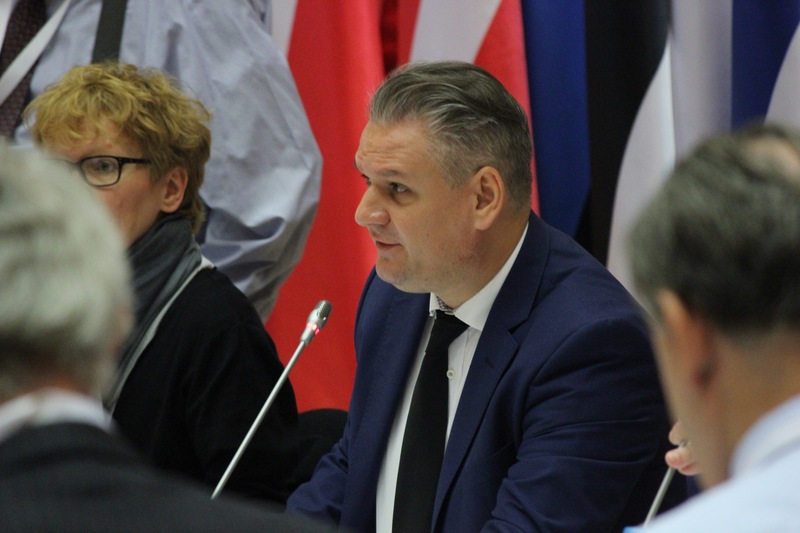 The meetings were held from 2-5 November 2015 in Debrecen. During the Plenary session all IHRA experts jointly underlined their support for the protection and preservation of endangered memorial sites and historical sites in all IHRA member countries. During the Debrecen Plenary meeting discussions were held on the former concentration camp Lety u Pisku (Czech Republic), the former Vilnius Ghetto Library (Lithuania), and the former concentration camp Staro Sajmište (Serbia). Particular attention was drawn to the legal dispute surrounding the former Rabbi Tsirilson Synagogue and Magen David Yeshiva situated in Chisinau, Moldova. The IHRA Chair was tasked by the Plenary to contact the political representatives responsible for the preservation of the former Rabbi Tsirilson Synagogue and Magen David Yeshiva in Moldova. Another key issue discussed in Debrecen was the topic of refugees during the Holocaust and today. On 9 September IHRA’s Working Group and Committee Chairs released a statement on the current refugee crisis and on 17 September IHRA’s Honorary Chairman, Professor Yehuda Bauer, issued a further statement. In Debrecen IHRA experts held a meeting to discuss IHRA's possible contribution on this topic. Initial suggestions for a pool of resources for teachers and a blog to allow contributions from IHRA delegates on the topic were well recieved by the political level. IHRA’s Committee on the Genocide of the Roma were proud to present the result of their project to compile both an annotated bibliography of research on the genocide of the Roma and an overviewof organizations working on the genocide of the Roma and contemporary issues concerning discrimination. IHRA’s professional development outreach program reported on their successful training initiativewhich took place in Moldova in September 2015. The project offered a comprehensive program for professional development for educators and teacher trainers in formal and informal education on the Holocaust and related issues. The project was run in cooperation with OSCE/ODIHR, one of IHRA's seven Permanent International Partners, as well as the Ministry of Education and the Ministry of Foreign Affairs and European Integration of the Republic of Moldova. Follow up activities are planned for 2016 as well as a further program. Other IHRA projects currently in progress include; the planning for a conference on the topic of the mass murder of people with disabilities and its connection to the Holocaust in 2016; IHRA’s second publication entitled ‘Bystanders, Rescuers, or Perpetrators? The Neutral States and the Shoah’ to be published in 2016; a research project on institutions, museums, governmental and non-governmental organizations that offer programs using a comparative approach to teach about the Holocaust and genocide; a conference on research on education about the Holocaust to be held from 14-17 February 2016 in Lucerne; a roundtable in Hungary on 2-3 December 2015 on the challenges related to preparing Holocaust Memorial Days; the launch of a database on research, educational and remembrance initiatives related to killing sites. IHRA is a unique intergovernmental organization which places political and social leaders’ support behind the need for Holocaust education, remembrance and research both nationally and internationally. Over four days, around 200 experts and policymakers from around the world representing 31 member countries, ten observer countries, and seven international partner organisations will meet to discuss the Holocaust as a contemporary political issue. The Plenary meetings will be followed by a conference in Budapest on 6 November. The conference, “The Holocaust in Public Discourse. Use and Abuse”, was organized by the IHRA Committee on Antisemitism and Holocaust Denial and was supported by the Hungarian Chairmanship. For more details, please click here.